I still can't stop thinking about These is my Words by Nancy Turner. I've never been so connected to a character in my life. What a story! I've just bought the next 2 books in the Sarah diaries and am fully engrossed. I want to introduce you to Nancy Turner. I hope you read her books. She is amazing!! "Writing historical fiction is much like working on a term paper every day. My story is never far from my mind. I create characters by mingling traits of people. I love all my characters, too, especially those with complexity that makes them seem all the more real. I believe the locale of a story can be as much a part of the book as a character, and I use settings I know well enough to describe in detail." :: Where did you find Sarah's diary? There wasn't a real diary, I chose to write the story like a diary. The character of Sarah is based on my real great-grandmother. I grew up hearing stories about her. :: Did you always want to be a writer? I didn’t start out to be a writer when I began my college education at the age of 40. I thought I was headed toward teaching high school English classes. I enrolled in a Creative Non-fiction writing class, hoping it would spark my abilities for upcoming term paper requirements in my coursework. After two years at Pima Community College, I was highly dismayed when I came to registration for the fall and there were no “real” classes in writing left other than a fiction class. Besides, I loved science. I loved to write, too, but I wanted to write about science. Full of doubts, I signed up for Advanced Fiction Writing thinking at least it wouldn’t hurt anything. :: Do you have any reading suggestions? 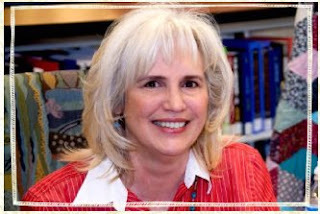 Check out Nancy's website for info about Book Club interviews, reading group discussion questions, online forum, and more! a loaded gun and a big knife." Very cool interview and a super fantastic quote! Which book is it from? I must read it!